Providers’ productivity (frequently evaluated on patient volume, CPT or procedural volume, total gross charges, and collections) often influences the level of physician base compensation in addition to the incentive compensation opportunities above the contractual baseline compensation. Similarly, Advanced Practice Clinicians (APCs) who are the Nurse Practitioners, Doctors of Nursing Practice, Physician Assistants, and Clinical Nurse Specialists also are usually functioning as employees of physician practice groups, health systems, and hospitals within employment contracts that provide a base compensation and benefit structure. However, the APC employment contracts infrequently offer a structure for incentive compensation above base. 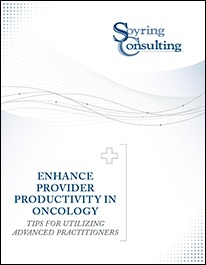 Given the complexities of billing and the appearance of productivity of providers compared to APCs, Chief Financial Officers of Physician Practices and Health Systems may start questioning the return on investment of the APC within the practice who appears to have low volume and collections based on those metrics. But, when implemented properly, the physician-aligned APC model brings a variety of benefits. How can you have the best of both worlds--appropriate productivity tracking and compensation, plus the right staffing to support providers and patients alike?